When I started travelling last summer, getting out of Europe was one of my biggest priorities. I wanted a change of culture, so with a week in Gran Canaria already booked at the beginning of July, Agadir — Morocco’s coastal city — popped up in my searches and I couldn’t help but be curious. Admittedly I’d never of heard of the place, and Marrakech was the primary hotspot everybody seemed to visit in Morocco, but I caught such a sweet deal for the newly renovated, 4 star Riu Tikida Dunas resort that I jumped at the opportunity. African sun. Moroccan culture and food. Beaches. Swimming pools. What could possibly go wrong? I don’t mean to come across as dramatic, but the one thing that let our holiday down was the lack of sun. Yes, you read that right: a lack of sun in Africa! 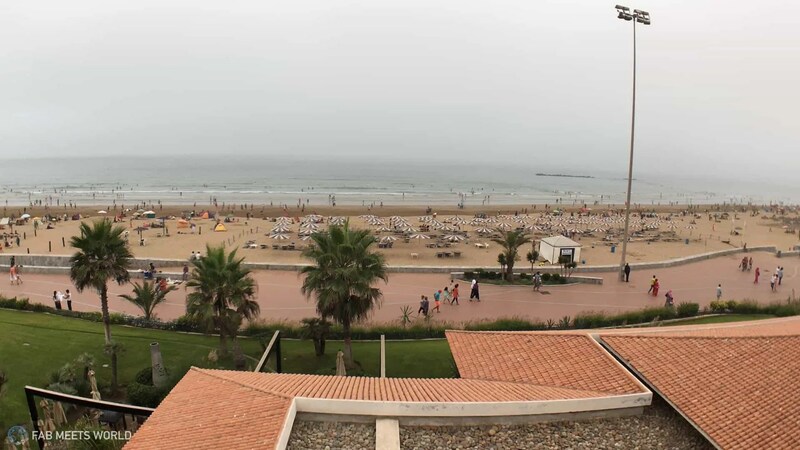 Apparently, because of its location on the coast of Africa, Agadir catches the cold air off the Atlantic and when it meets the warm Moroccan air, it creates a lot of fog and cloudy conditions. So while you’ll still be sitting in 20+ degree heat, you’ll probably end up needing a thin coat/jumper anyway because of the breeze and overcast conditions. I tried swimming in the resort’s pools, and it just didn’t feel comfortable or nice without the sun out. Move further in-land and the weather does clear up — something I noticed when we were away on excursions like quad biking — but if you’re intending on lounging on a sun-bed or on the sand at the beach, Agadir’s unpredictable weather makes it very difficult. It’s not all doom and gloom because there are many days when you’ll get beautiful clear blue skies and not a cloud in sight, but when you’re forking out money on a beach holiday, inconsistent weather isn’t something you want to be worrying about. And to be clear, I went back to Agadir once again this year (this time in August) and it was the same; some days clear, some days grey. For days when the weather isn’t great, there’s still a few things you can do to keep entertained. Morocco is of course famous for its souks (markets), so if you’re keen on shopping then heading to Agadir’s large souk could take up a whole day! Between candles, herbs & spices, bags and jewellery, you’ll find something for everyone there — and it’s a great way to experience Moroccan culture. Being a tourist location, Agadir has plenty of excursions you can take up including quad biking, jet skiing and other water sports too. If however you’re set on a resort break with plenty of sun, booking a trip to Agadir could be a gamble.